When most people think of retaining walls, usually only one kind comes to mind; the kind that you see holding back a hillside. While this is one function of a retaining wall, there are many new styles and functions of retaining walls. Walls can be made from many different materials including natural stone, wood, and man made products. They satisfy a variety of outdoor needs and can be both functional and decorative. Available materials come in a variety of sizes, shapes, and colors and can be installed in many different ways. They can be dry laid, wet laid, or fastened together, depending upon the design and function. While some retaining walls are constructed for engineering purposes such as retention due to grade changes, free standing wall Retaining Walls now can include pillars, columns, and pilasters which can include natural stone caps as well as lighting to modify the ambiance of the area. A freestanding wall can create privacy, decorate an area, and direct guests and family traffic.s can be used for many applications. One of the most popular uses is to border a new brick patiowhile adding additional seating for you and your guests. Free standing walls can also be used to define your outdoor livingspaces and outdoor rooms. Erosion is a natural, but potentially destructive process in which soil is actually washed off your property. This erosion can result in damage to trees, shrubs, and other plantings, the collapse of a driveway, or even more serious damage to your home or property.An engineered retaining wall can provide stability to a hillside, while also creating an aesthetically pleasing backdrop for plantings. 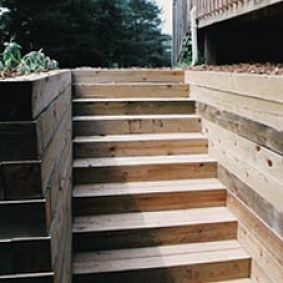 Retaining walls can take unusable sloping areas create new, usable "flat space" for your outdoor area. Retaining walls are only as good as their construction. 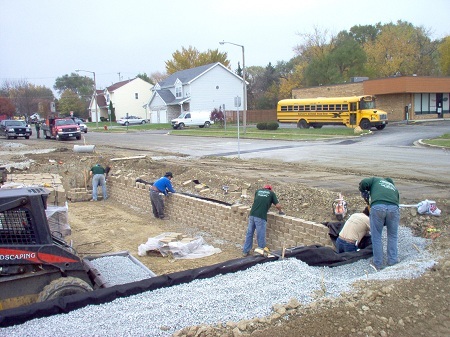 At Suburban Landscaping we adhere to the best construction practices and standards when designing and installing a retaining wall. When the project calls for it, our professional engineer will design the project. Walls can be constructed using several different types of wall materials, such as natural stone, segmental blocks, railroad ties, and landscape timbers. Each product has its positives and negatives, and each has different pricing and uses. Timber walls are treated to prevent decay from the weather, while segmental blocks are made from concrete and withstand weather very well. Natural stone walls have a more rustic, or natural look while segmental block walls have a more uniformed or formal look. There are several variables that determine the price of a custom retaining wall such as size, location, type and materials used. In general, the landscape industry prices walls according to Face Feet, which is the height of the wall x the length of the wall. Prices start as low as $15 per face foot and go as high as $45 per face foot. 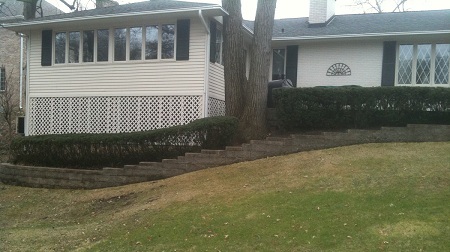 Retaining walls used as a bed edging are often less expensive. 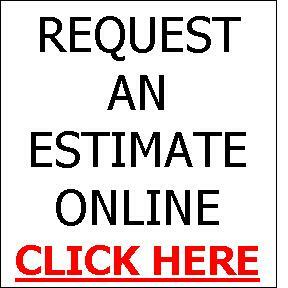 We would be happy to provide you with a free consultation and estimate, or visit our pricing guide for some approximate prices.